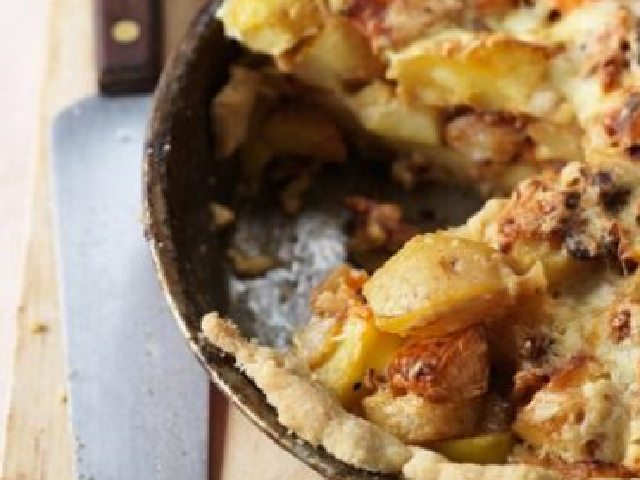 A traditional West Country open pie that’s cheap, filling and quick to make. It’s best eaten warm rather than hot, and it’s really good cold so ideal for picnics or lunchboxes. Vegetarian and vegan options: Use mushrooms or smoked tofu instead of bacon. Or use a vegan soya-based cream cheese instead of egg and milk. Allergy advice: Can be made with gluten free flour, lactose free cheese and soya milk. Place the flour, oil, water and a pinch of salt into a bowl and mix to a dough. If you use wholemeal flour you will need an extra dash of water. Cover and refrigerate for 15 minutes. Then sprinkle a flat clean surface with flour and roll out the pastry ½ cm (¼in) thick, to line a lightly oiled 20cm x 4cm (8in x 1½ in) deep round metal tin. Meanwhile, add a dash of oil to a pan, add the bacon and onions or leeks, and stir regularly until onions start to brown. Add the apples and root vegetables and cook a further 3-4 minutes, still stirring regularly. Add the milk, ¾ of the cheese, a little salt and pepper. Stir for 1 minute, then mix in the egg and put the mixture into the pastry case. Top with the rest of the grated cheese and bake 20-25 minutes in a preheated oven 180°C/Gas 6/ 400°F until golden brown. Use up: Boiled, roast or baked potatoes; other cooked vegetables like broccoli, cauliflower, green beans or squash; or cooked chicken. Variations: Use any cheese including blue or goat’s cheese. Use pears instead of apples; add walnuts. Try smoked bacon or ham, chorizo or smoked haddock. Extra flavour: Add herbs such as basil, parsley oregano, chives or tarragon. Add a teaspoon Dijon mustard or a teaspoon of curry paste or crushed garlic. Freezer advice: For best results, cool down quickly (ideally within an hour), divide into portions, place in an airtight container, label and then pop in the freezer. Defrost in the fridge, ideally overnight, and use within 24 hours after defrosting. Reheat in microwave or covered in foil in the oven, heating thoroughly until piping hot. The Co-op and Love Food Hate Waste recently joined forces to help Co-op colleagues to make the most of their food and drink.